Chicago-bred rapper Serengeti (aka David Cohn) has been on a tear lately. Last month his new trio with Anticon labelmate Son Lux and Sufjan Stevens, s / s / s, released its debut EP, a collection of schizoid pop tunes called Beak & Claw. Last week he dropped a solo EP, Kenny Dennis, his fourth release as his alter ego of the same name—a fortysomething former telephone-booth repairman who rhymes in a thick Chicago accent. 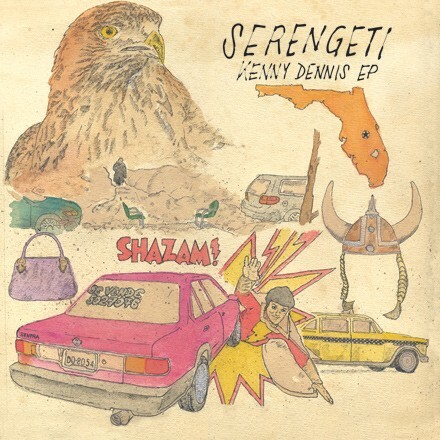 Introduced on 2006's Dennehy, Dennis was a member of Tha Grimm Teachaz, a fictional hip-hop group briefly signed to Jive in the early 90s—and Serengeti has released the album that the label supposedly shelved, where he lovingly re-creates 1993 styles. (Dennis also has a long-standing beef with Shaq, which he airs on the Kenny Dennis cut "Shazam.") Serengeti tells Gossip Wolf that he's fielded offers to expand Dennis's intricate backstory into a larger narrative—a feature film, a mockumentary, a sitcom—but nothing has panned out yet. This wolf has spent serious blotto hours at Gold Star, the old-school Division Street watering hole co-owned by Susan Stursberg. If you've ever parked it on a barstool in the company of their righteous jukebox, she's probably been the one sliding a few pints (and complimentary baskets of popcorn) your drunken way. Sadly, Stursberg was recently diagnosed with pancreatic cancer—which has resulted in the usual out-of-control medical bills. On Sun 4/22, a slew of top-notch local acts are playing a fund-raiser at Double Door—the stellar lineup includes Joan of Arc, Del Rey, Coffin Pricks, and a DJ set by Bobby Conn. You can also donate at giveforward.com/helpsusan. Last week the Pitchfork Music Festival finalized its lineup, and it turns out there's another early Gossip Wolf pick in the mix: the reunited Chavez! The Chicago contingent now includes Outer Minds and A Lull, alongside previously announced acts the Atlas Moth and Willis Earl Beal. Do us proud! Serengeti hasn't got a posse. And he's OK with that.